A little update on my first week as a bee keeper. We picked up the bees on July 31, 2013. It was a 45 minute drive to the guys house, as it turns out he lives in the middle of no where. He was really nice when i asked him how many hives he had he said he didn't know right now. That surprised me until he started to show us around. Apparently he captures swarms and just stores them then he sells the hives as they start to lay eggs. He normally over winters about 45 hives then sells all but 20 in the spring. A nice little side business when you consider what he can get for them in the spring. I think i will wait a few years before i try and do that. He was nice enough to move the frames for me from his hives over to the travel boxes i had borrowed from the local bee club. We packed the girls in the car and drove home. I was worried we would end up with bees in the car but it wasn't to bad i think we drove with 3 bees buzzing around the windows in the back of the car. By the time we got home it was 21:30 but not really dark yet. 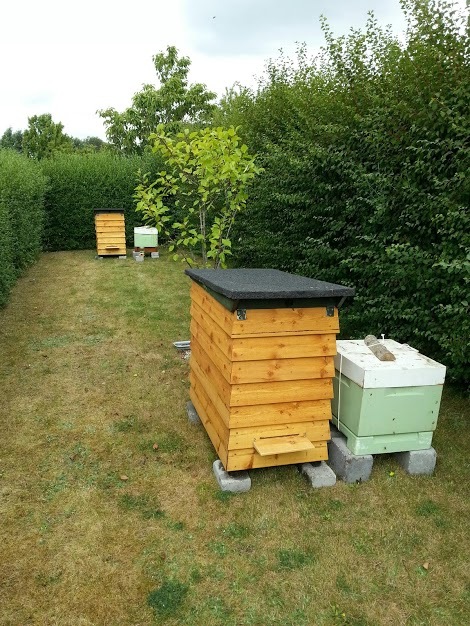 He told me to put the hives next to my hives and wait a few days to move them. Here's where the fun started. The next day I couldn't wait to get up and go out to check on them then I found myself out checking on them almost every hour. I had to make sure they where OK. I didn't open the hives i just watched them going in and out. 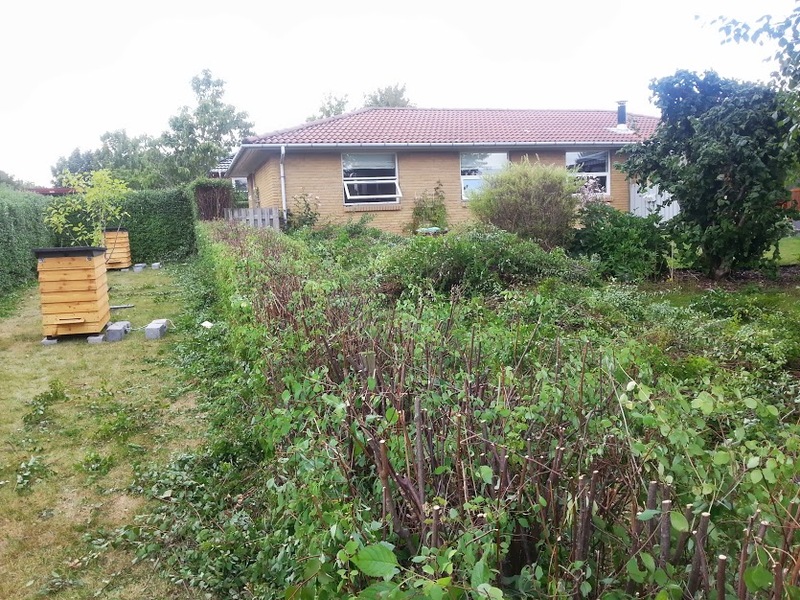 Sunday we needed to trim the hedge. It took about an hour and a half and a really good set of pruning shears. Lars managed to destroy the hedge trimmer. I tried to tell him its not designed to do that. Men never listen. Since the girls had been so nice i decided it was time to move them to there new hives. Suited up put on some gloves and off i went. I didn't bother with smoke, from what i read it can take them a few days to get over smoke and they are such small bee families i didn't want to set them back any more then i had to. It didn't take long, not much buzzing in the first hive the second one talked to me a bit. 2 of brood saw some uncapped that wasn't more then a day or two old, and some capped. didn't see eggs but i'm bad at spotting eggs. I blame it on the veil but its probably my glasses. 3 frames of honey not all caped though. Saw several stages of uncapped brood. Full frame of capped brood that looks like its starting to emerge. No sign of the queen. 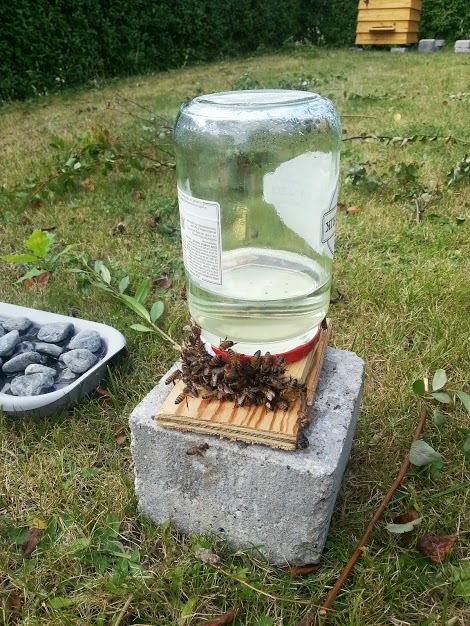 I decided to put some sugar water out for the little hive so i built my own little bee feeding system. I really should have read more about the fact that open feeding can start robbing. When I got home from work on Monday I was out stalking the bees I mean checking on the bees. The front hive looked fine bees flying in and out. Then I walked by the sugar water I had set out to feed them. They where hungry most was gone good girls eat up. Then I came to the second smaller hive. I watched for a few minutes I just love to watch them. Something seamed different. I must have watched for 5 minutes I couldn't figure it out. There where bees at the landing pad trying to keep other bees from coming in. One even had another by the leg and wouldn't let it go. Then finally something i read kicked in. These where guard bees trying to keep the other bees out of the hive. So i ran into the house to check my books on exactly what robbing looked like. Went back out to double check yup that's got to be whats going on here. So i blocked up most of the entrance left them about 2 cm checked again about 2 hours later it was mostly dark by then and things looked better. OK so no more open feeding the next day i put the little feeding system in the back of the little hive and promptly ordered a real in the hive feeding tray. I guess that's it from my first week bee keeping. Bees don't mind me trimming the hedge. I can inspect a hive but really should go slower and take my time looking for queen and eggs. I know know what to look for when i see robbing. Pollen comes in different colors! Who knew i thought it was just yellow. Nope there is blue pollen.